I was highly affronted last night! Turns out the second trio of Spanish guys was worried V had been left on her own as I raced ahead. Not sure if they thought we’d had a falling out but they didn’t think she should be alone. 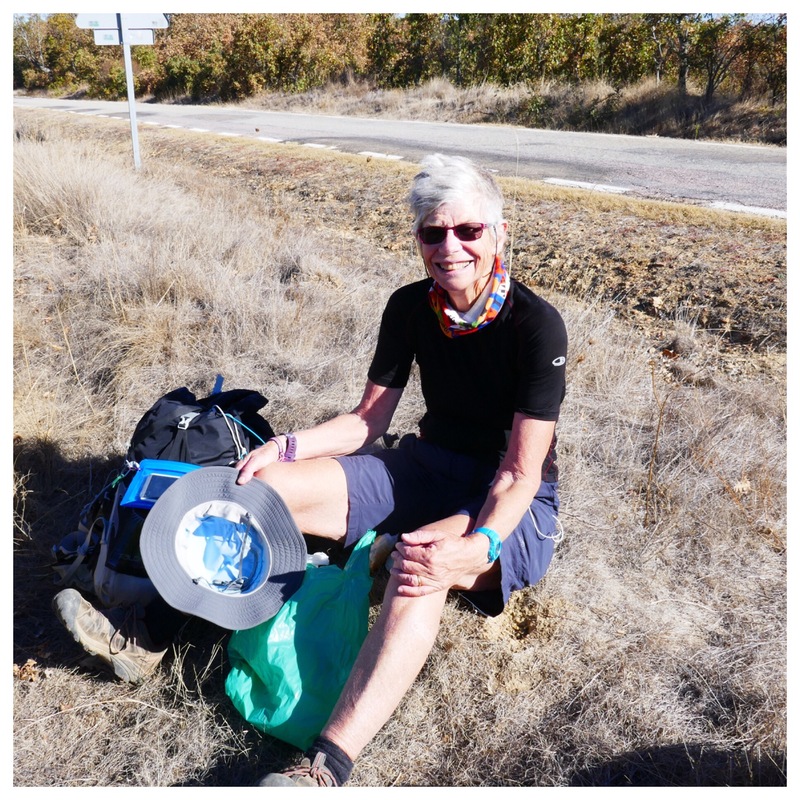 If only they listened properly and exercised their neurones a little: she left Malaga alone, managed the whole distance alone until the day after Córdoba, having met only one or two other walkers in that time. Meaning, she’s clearly capable of managing alone and doesn’t need me or anyone else to hold her hand and to stay with her. We’ve always automatically walked together in the dark, as we did with the boys in pairs or fours, as more eyes help in ensuring you stay on track. I hasten to add these three men always walk very very closely together, are never apart and must feel a bit vulnerable and believe it affects others similarly. Oh, especially women since they felt obliged to comment. Even as they left the supermarket in Fuenterroble they were in a tight formation. Second lot of Spanish male ‘triplets’ who’ve affected us. Weird. And yes, the fourth guy was, I’m sure, deliberately keeping back if only from the noise they make: chat chat chat. V wasn’t totally surprised. Sigh. Thankfully one of the nicest guys I’ve met this trip was spanish, Jésus, or I’d have wondered about the men here. Starting today, Sunday, light now arrives at about 07:30. We changed over last night. Thankfully. Made starting today easier. Was a bit confusing as I don’t know how all my devices knew to change as our signal varied from nonexistent to nearly nonexistent. As we left the Fuenterroble albergue the guy in charge offered us breakfast. Ha ha! Waited until after we’d made arrangements with a local bar to tell us they offered breakfast to peregrinos. I wasn’t sorry we’d set up going to a bar as, except for a very pregnant Mrs Puss and another puss on heat, V and I were the only females and the religious donativo felt very blokey. At this time of year most walkers on this route are men and I’m happy that again we avoided sharing with at least 5 of them last night. A very foggy start to the day’s walk. Some frost on the ground too. Great track after a short time on the road. We left first, no torches needed today. Hooray. Beautiful bucolic splendour. The sun came up and cleared the fog away. Soon after we started climbing up to the set of windmills along the crest of the hill. 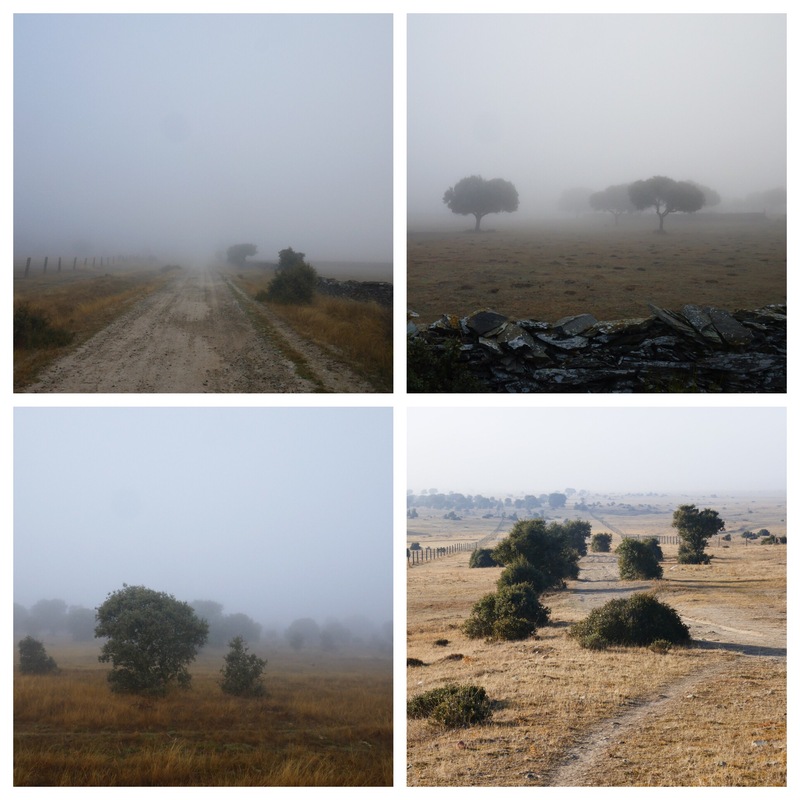 And then slowly down and along flatter (undulating), dry countryside. 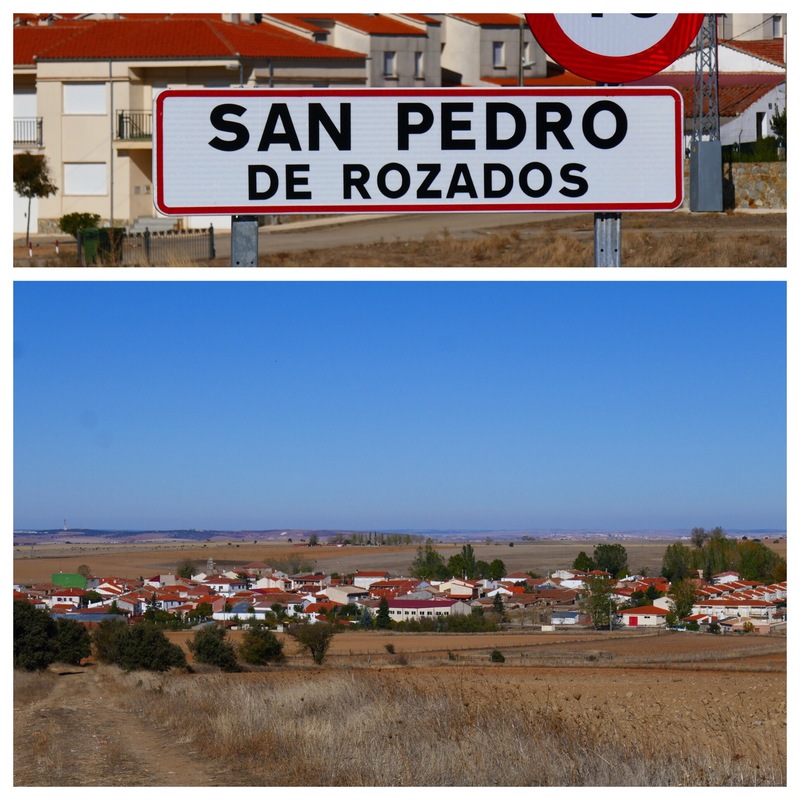 And finally our town for the night, San Pedro Rozados. In this town in 2013 Ekhardt and I ended up in a small house with a room each. Overflow from a hotel or albergue and great for us. Interesting lunch (at 16:00 or a bit after): farináto (a mix of fried bread crumbs, pig fat, egg, cinammon and annisette), a mixed salad and then spaghetti. The farinato is a local speciality and very nice. Luckily we were sharing it and the salad so not too much. Very interesting, the farinato – to me a tastier version of the migas (breadcrumb etc mix) from further south in spain. Again a much loved local dish that I guess was once leftovers eaten by peasants. If not, leave me with that delusion. Tomorrow we will meet up again with one of the very few women we’ve met so far, Monica (French), in Salamanca. Yes, Salamanca tomorrow. Just 24km between here, San Pedro de Rozados, and there. I’ve got a hotel booked and am looking forward to it. V will stay a night or 2 and then head off towards Santiago. I’m staying until Friday. 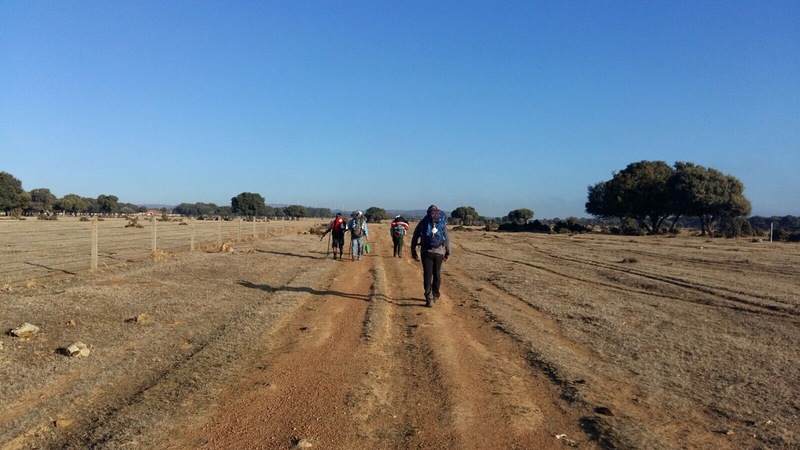 By the time we arrive I’ll have been walking for nearly 5 weeks (4 + as I had 2 days off in Córdoba and 1 in Merida) and have clocked up a bit over 600km. If you translate the following word for word you end up with a very very strange notice.